SARD Blow Off Valve - R2D2 - Dezod Motorsports Inc - Home of the automotive performance enthusiast since 2002. 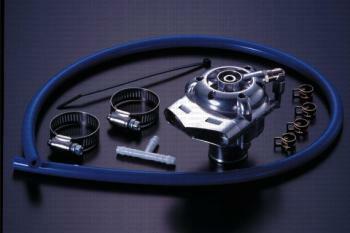 The R2D2 Racing Twin Drive Type-2 BOV is SARD’s premier blow off valve for performance tuned vehicles. Improves boost response, and can hold higher boost levels. The R2D2 has several option parts, such as the through type to recirculate back into the intake tract, which some cars need for proper TPS operation. Additionally, the SARD R2D2 Blow off Valve is offered as a Universal piece for welding onto intercooler pipes or vehicle specific kit to install with factory piping. The R2D2 emits a clean, powerful sound that is not obnoxious or high pitch like other blow off valves.